Any group of people which captures a goat and crowns it king for a week every year, are most certainly great fun or maybe totally bonkers. Yet that’s what they do in the town of Killorglin in County Kerry. 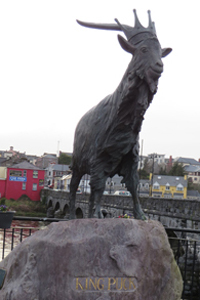 They’ve also erected a statue in the goat’s honour, beside the beautiful cut stone bridge over the river Laune. While the goat may be king in Killorglin, the real King of Kerry must be the landscape itself. Wild rugged mountains, sea cliffs plunging into the raging Atlantic Ocean, hidden Corrie lakes, rushing rivers, ancient forests festooned with moss and lichen and endless unspoiled beaches greet the visitor around every bend. There is only one problem. How much can you pack into one holiday? While using Killorglin as a base the possibilities are endless. For starters, golfers are spoiled for choice for sure. Some of Ireland’s most famous Links courses are in the area and Dooks Club, one of the oldest clubs in the country is almost a stone throw away. Kayakers could do some decent paddling on the River Laune which runs right past Trident’s Grove Lodge Holiday Homes. Maybe start up at Lough Leanne where there are at least sixteen kilometres of a river to navigate. Most noteworthy, permits are needed and boats need to be washed for Zebra Mussels. Good paddlers could also surf the waves on the other side of Dingle Bay at Inch Strand. Newbies to surfing can hire wetsuits and boards and get lessons and there’s even a great café right on the beach. Amongst climbers and walkers Kerry is indeed King. 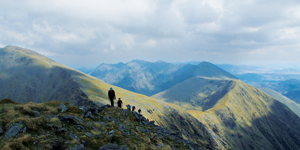 Almost all of Ireland’s highest peaks are to be found here. Cronin’s Yard is one of the main starting points for ascents of Ireland’s highest mountain, Carrauntoohil. Situated at the entrance to the Hag’s Glen, this is certainly the gateway to the MacGillycuddy’s Reeks. 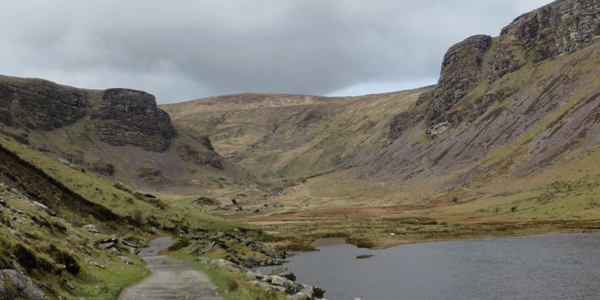 Less serious climbers could combine a really decent walk with a bit of history, by heading up to Annascaul on the Dingle Peninsula. 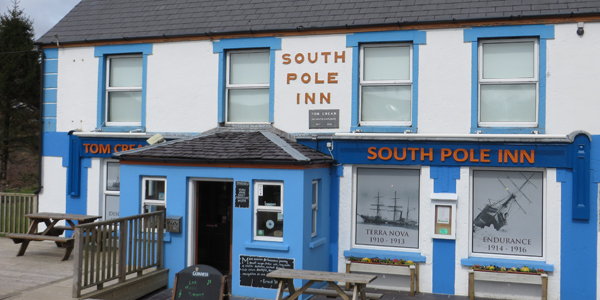 This is the village forever associated with the famous Antarctic explorer Tom Crean, who on his return from the last expedition with Shackelton settled down and opened the South Pole Inn. The Photos and memorabilia of Crean’s exploits displayed on the walls of the pub make for exciting reading. Outside, lunch can be taken to the sounds of birds and rushing water. The river flowing out of Lough Annascaul rushes down through the village, under the lovely old bridge. A gorgeous walk along a green route starts at this stunning Corrie Lake, surrounded on three sides by steep rocky crags. High above, dare devil sheep can be made out as little white dots. Peregrine Falcons and Ravens glide on the thermals. The caw cawing of the Ravens adds to the otherworldly feeling of this empty place. Look out for the Mass Rock towards the back of the valley before the second gate, a reminder of the great faith of our forefathers. Kerry unlike any other part of Ireland has an ancient Yew Forest, one of only three remaining in Europe. Hense, a visit to the forest on a wet day is a magical experience. From Killorglin it is about a twenty-six kilometre drive. Head for the Torc Waterfall just outside Muckross House and follow the path upward into what could be a scene from Lord of the Rings. At any moment children could expect the trees to come alive and start walking or talking. On a wet day guided tours of the house would be a good idea. However, it is the absolute beauty of the landscape which attracts thousands of visitors to this part of Ireland at all times of the year. When it comes to eating Killorglin has plenty to offer. A restaurant in an old church immediately grabs the attention. While serving Spanish food with a wonderful atmosphere of light and airiness, it is hard not to go back there again and again. However, this would be a mistake because another totally different experience can be had by heading down the road to Jack’s Seafood Restaurant. Located beside the beach at An Croman in an old Coastguard Station it truly is a unique dining experience. A bracing walk along the sandy beach will almost certainly whet the appetite. Maybe spotting a ‘Mermaid’s Purse’ and taking it with you, might give everyone something to puzzle over while they wait for the food to arrive. Contraily, diners at Bunkers Pub in the town of Killarglin have a completely different eating experience. On certain nights there will be live music and the food is good, plain, wholesome fair. Due to it’s size, visitors to Ireland, might look at the map and think they can ‘do’ Kerry in a day. While they could just drive along the main roads and see lovely scenery and tick it off, in a life time no one could really claim to have explored every centimetre of this extraordinary part of Ireland. Ancient mountains, medieval friaries, Natterjack Toads and Minke Whales, fishing and cycling, bird watching and plant spotting, art exhibitions, writing festivals and even Darth Vader. The list goes on all you have to do is get here. If you want the keys to your own Kingdom then take a look here for all Trident Holiday Homes available in Kerry. Blog written by: Deirdre Davys.